Harley and Sandy Caldwell's farm has been in the family for 100 years and was recognized at the Kandiyohi County Fair this month as a Century Farm. The 160-acre farm was purchased in 1902 by Harley's grandfather, Lewis T. (L.T.) Caldwell, who moved his family from Iowa into the huge house just east of Hawick. The farm was primarily a dairy farm in those days and according to Karen Caldwell Watkins, Harley and Sandy's daughter, it was mostly self-sufficient - the family grew crops for their own animals and food for themselves. 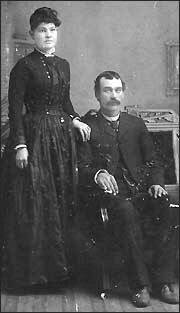 Lewis T. Caldwell and his wife Sara in the late 1800s. L.T. spent 49 years on the farm and his son Virgil stayed on for a long time to help his father and although he left the farm for a while, in 1951, after his father's death, Virgil purchased the farm. Virgil and his wife, Mildred, had the farm for almost 20 years. Under their ownership, the farm remained primarily a dairy farm, but the family also had some beef cattle as well as other small animals. Virgil and Mildred retired from farming and Virgil's son Harley, and Sandy purchased the farm in 1968. In 1970, they moved their four children from the cities to the farm where Harley was born. The family raised black angus cattle and crops on the property, but now the property has been returned to prairie grass. The house, a machine shed, a chicken coop and a wellhouse were the only original structures on the farm when the family moved there in 1970, all of the smaller structures have been lost, leaving only the house, which has an interesting history of its own. 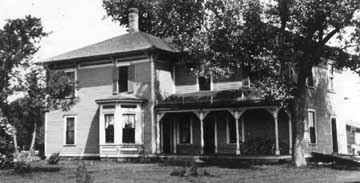 The Caldwell's home as it appeared in the early 1900s. The farm, which was given to one of its original owners for his participation in the Spanish American War was also used at one point as a horse race track. It was sold in 1898 to a couple who settled into the farmhouse which was a small log cabin with a dirt floor. According to Karen, legend has it that the woman's father came to visit and was appalled by the conditions his daughter was living in and ordered his son-in-law to build a new house at the father's expense. The new house was huge - too big for the woman to take care of by herself so she had to hire live in help. Soon after, the husband ran off with the hired girl and the wife was forced to put the farm up for sale. As it happens, L.T. had come up earlier from Iowa and had made a down payment on another farm, but when he returned with his wife, Sara, she didn't like the farm he had picked out. L.T. managed to get out of that deal and, because the timing was just right, the couple found the farm their great-granddaughter would come to call the Caldwell family legacy.